An initial deployment of a prototype network of at least four permanent GPS stations is to occur between mid-April through mid-May. In preparation, two reconnaissance trips were made. The first took place in June 2005 during which time the local collaborator was met and several potential site locations were visited. During the second trip in January 2006 several more sites were considered and final location selections were made. Two deep drilled braced monuments (DDBM) and two short drilled braced monuments (SDBM) will be installed. A competent drilling contractor was found as well as the stainless steel for the monuments. This may potentially be considered the first phase installation of a larger future effort involving multiple GPS and other sensors. At least two of these sites will be chosen to provide real-time data at 1-second intervals through a VSAT system, with near real time data processing done for demonstration by the Rosenstheil School. Most of the sites will use a cellular GSM system for data transfer to OVSICORI. 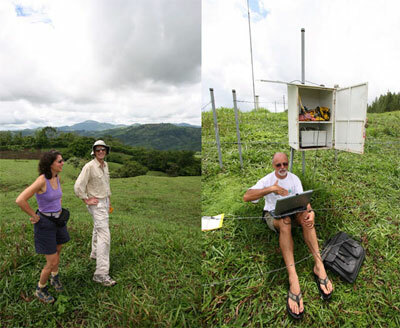 Data will be retrieved over Internet by both UNAVCO and the Geodesy Lab at the Rosenstheil School.